At first glance, it might seem that Mort Cinder‘s plot structure is relatively straightforward if not downright simplistic. Over and over again, objects Ezra and Mort encounter in the antique shop evoke the past, prompt a story or, at times, lead to direct intervention in historical events. 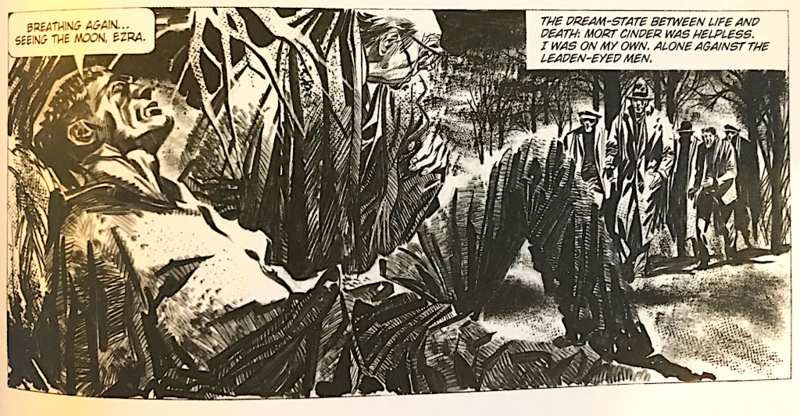 But it is this very framework that made it possible for the artist, Alberto Breccia, and the writer, Héctor Germán Oesterheld, to not just employ but to exceed the parameters of traditional adventure comic strips and serials. Héctor Oesterheld scripted comics for a number of publications and had already worked with Breccia before Mort Cinder‘s inception—as well as with revered Italian artist Hugo Pratt—on action and adventure strips such as Ernie Pike, Doctor Morgue, and Sherlock Time. So by the time of Mort Cinder‘s publication in weekly Mexican magazine Misterix in the summer of 1962, the writer’s place as a leader in the history of Argentine comics had been forged in his best-known work—1957’s wildly successful serial science fiction strip about suburban Argentines battling a violent alien invasion called El Eternauta (“The Eternaut”), which was drawn by Francisco Solano López and launched in weekly magazine Hora Cero. Breccia helmed art duties on a more overtly political El Eternauta relaunch in 1969, which followed his collaborations with Oesterheld on the 1950s comics, a graphic biography of Ernesto “Che” Guevara, and Mort Cinder. As I wrote for Hyperallergic in 2016, the political overtones in works like El Eternauta and Che were likely what drew the attention of the Argentine dictatorship toward Oesterheld: He and several family members disappeared in the late 1970s, when he was kidnapped by militarized forces dispatched by the government and never seen again. Vivid lyrical imagery aside, having worked through some of this big book, I find myself agreeing with what critic Matt Seneca gets at in The Comics Journal, that these strips are “variable in quality,” narrative-wise. The effect that the visuals have on me, however, is altogether different. Breccia, whose innovative, mixed-media visualizations of H.P. Lovecraft stories would follow Mort Cinder a decade later, used toothbrushes, razors, and more to produce textured finishes and harsh, bottomless blacks in his fastidious drawings. Breckenridge cites his working in “a completely dark studio space lit only by candles.” In these early chapters, Breccia’s ink-spattered cemetery backdrops and damp, winding English nooks, lined with ornate housing facades and shadowy cobbled streets partner with a stylish representation of what’s commonplace in the strip—the ubiquitous skin folds in Winston’s face (modeled after the artist’s own), his furrowed brow, the flecked pattern on his scarf and overcoat. A six-page “Prologue: Ezra Winston, Antiquarian in ‘The Gift of the Pharaoh,'” which isn’t connected to the “Mort Cinder” character and never even leaves the confines of Winston’s store, is replete with magnificent composition. Note the pristine lines in Winston’s furnishings and stray artifacts in the establishing panels. Or the illustrative detail in the Egyptian woman’s geometrically elaborate garb. Or the marvelously realized, proto-psychedelic orbit of blots and inky swirls in the shopkeeper’s hallucination. The culminating effect is striking—Breccia’s ashen pages leave me transfixed, as if I were handling some rare and precious object for the first time.